Saturday saw many Addicks head north towards Derby, however, I travelled south to the St Lawrence for the T20 quarter final between Kent and Lancashire. I arrived in Canterbury at 10.30am which allowed plenty of time for a hearty breakfast and a couple of pints of ale in the Bat & Ball before entering the ground shortly after the gates opened. The sun slowly emerged and it turned out to be a splendid day weatherwise. Sadly, the cricket didn't up being so glorious despite Kent's best efforts to recover from a poor start. The game was lost on the last ball as Lancs garnered the two runs they needed to tie the scores and thereby win on the basis of having lost fewer wickets. Northeast missed a trick I felt as he'd have been better off bringing in the field saving two and forcing a more attacking shot to hit over the top. Hey ho ! Kent have done so well this season in the T20 without the luxury of an overseas player but to lose in this manner was cruel. I've not seen the game back yet but it looked as though umpire Nick Cook did us no favours. 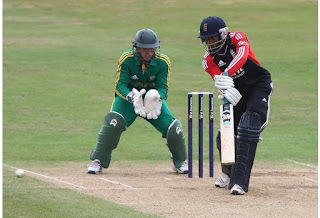 It is to be hoped that this group of players can stay together as the future looks reasonably promising if they can although there needs a vast improvement in the red ball game. Post match saw a return to the Bat & Ball followed by a Mexican and few more beers in Canterbury before retiring for the night. The last three days were also spent in Kent in the Romney Marsh area. I spent many a childhood holiday there and it still holds its appeal for me. It remains reasonably unspoilt and the beach at Greatstone is as good as most offering plenty of room for games of footie and cricket when the tide goes out. The DD part of the headline refers to our two draws and two points secured in the Midlands on Saturday and Tuesday. I don't think many would have been too upset with that ahead of the games although it sounds as though we should have secured all 3 points last night with the Great Dane guilty of a couple of big misses. However, we remain unbeaten and have played 3 of the seemingly tougher teams in the division. That won't change with the visit of Hull. A win against the Tigers would certainly represent a great start for the Addicks. We are nearing the closure of the transfer window and it is to be hoped that we can get more players in. We certainly need a keeper and another striker, one who can find the back of the net regularly. A winger and centre half would be good too but they seem most unlikely. All will be known in a fortnight's time with a lot of water to pass under the bridge in the meantime with a lot depending on the movement of players in Premier clubs and the resultant trickle down effect.